The Cowboy Culture as we know it has been defined as much by dime novels, movies, and television as any legitimate history book. The real cowboys of the 1800s and into the early 1900s were hardly as handsome or as musically talented as those actors playing the parts. Working cowboys were the earliest blue collar class of laborers trying to make a living in a rapidly modernizing, changing society. You don’t shoot another man in the back—you face him straight on. You never disrespect a lady (even those with little respect for themselves, if you know what I mean.) And you don’t take someone else’s property—whether it be a horse, a cow, or a gold mine. All good boys understood the Cowboy Way and we yearned for the opportunity to prove it. We wanted to be the Good Guy with the White Hat and we wanted to ride into town and save the day. The picture ponies gave us a chance to live that moment. By most accounts the business of photographing kids on ponies began not long after the camera was invented. There are tintypes in museums with faded images of boys and girls astride, usually Shetland horses. There were also traveling photographers with goat drawn carts and other animals willing to be sat upon long enough for a picture to be taken. Sometime around the 1930s—not coincidentally about the time of the first B-movie Westerns—pony photographers started carrying a collection of cowboy costumes. The idea was a smash success and over the next 40 years millions of children would be photographed on a pony outfitted in vest, chaps, six-guns in a holster, and a cowboy hat. Ask a room full of boomers to raise their hands if they every sat on a pony for a picture and you’ll soon discover it was an experience shared en masse. 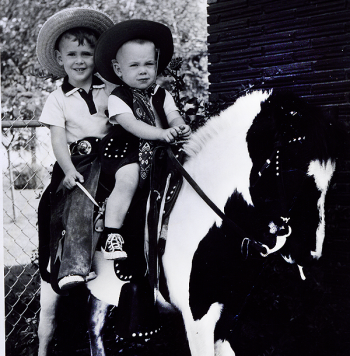 For city kids a few minutes on the back of a rented pony was as close as they would get to being a cowboy. But the photo would last a very long time. 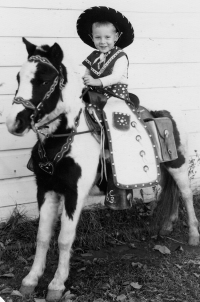 Note the chalk marked number “C63” on the stirrup that identified the customer, in this case three year old Danny Dale Acree of Okmulgee, OK.
As the rider aged the photo might find its way into a frame and placed with reverence next to other cherished childhood keepsakes, like the photo of the naked baby on a white rug, or next to the subject’s bronzed baby shoes. At that very moment sitting on that pony, each of us became Hoppy, Gene, or whomever might be our cowboy idol. For an instant and recorded on film forever, we became a real honest-to-goodness cowboy. And we felt as strong, and as brave, and as honor-bound as our idols. We were Roy Rogers while in the front yard of our house in Minneapolis, in the apartment courtyard in Okmulgee, Oklahoma, or in front of the stoop of our Brooklyn row house. In 1921 Fred R. Barnard in the advertising journal Printer’s Ink first coined the phrase “One Look is Worth A Thousand Words.” He later rephrased the ad headline to read, “One Picture is Worth Ten Thousand Words,” and credited it to an ancient Chinese proverb. The only thing ancient about the line was that he had made it up six years earlier. Regardless, I get his meaning. When Charlie and Gloria Morton purchased the Inn of Many Faces in 2001 from sisters Pat Gunter and Judy Johnson, they bought not only a beautifully restored and furnished Victorian home, but also a collection of faces scattered throughout the house. Many of the faces are carved in the lovely old pieces of furniture, not glaring out at you, but quietly waiting for you to find them.